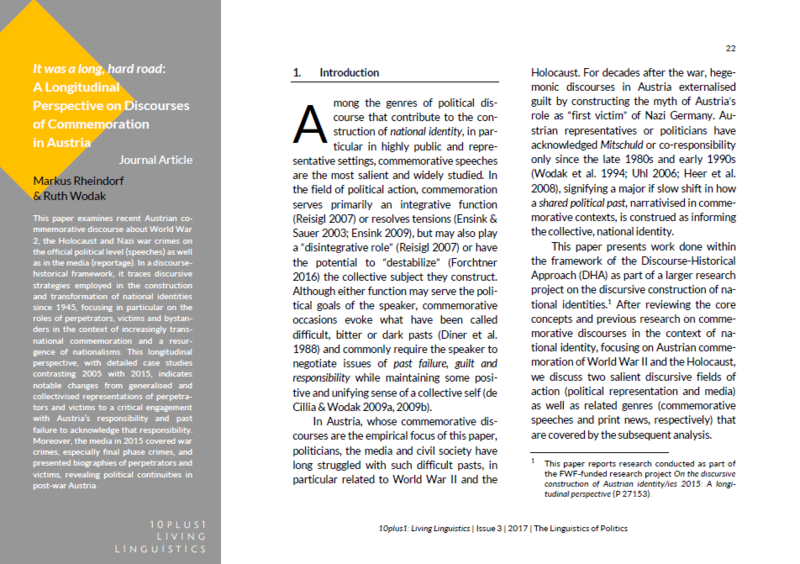 This paper examines recent Austrian commemorative discourse about World War 2, the Holocaust and Nazi war crimes on the official political level (speeches) as well as in the media (reportage). In a discourse-historical framework, it traces discursive strategies employed in the construction and transformation of national identities since 1945, focusing in particular on the roles of perpetrators, victims and bystanders in the context of increasingly transnational commemoration and a resurgence of nationalisms. This longitudinal perspective, with detailed case studies contrasting 2005 with 2015, indicates notable changes from generalised and collectivised representations of perpetrators and victims to a critical engagement with Austria’s responsibility and past failure to acknowledge that responsibility. Moreover, the media in 2015 covered war crimes, especially final phase crimes, and presented biographies of perpetrators and victims, revealing political continuities in post-war Austria. Markus Rheindorf is a Senior Researcher and Lecturer at the Department of Linguistics at the University of Vienna. His research interests in discourse studies include argumentation, historical discourse analysis, academic discourse and the construction of national identities. In recent years, he has focused on integrating qualitative and quantitative methodologies in a Discourse Studies framework. Ruth Wodak is Emerita Distinguished Professor of Discourse Studies at Lancaster University, UK, and affiliated to the University of Vienna. Besides various other prizes, she was awarded the Wittgenstein Prize for Elite Researchers in 1996 and an Honorary Doctorate from University of Örebro in Sweden in 2010. She is member of the British Academy of Social Sciences and member of the Academia Europaea. Her research interests focus on discourse studies; gender studies; language and/in politics; prejudice and discrimination; and on ethnographic methods of linguistic field work. Ruth has published 10 monographs, 27 co-authored monographs, over 60 edited volumes and ca 400 peer reviewed journal papers and book chapters. See http://www.ling.lancs.ac.uk/profiles/Ruth-Wodak for more information on on-going research projects and recent publications.